By James Frese, Vortech International, Inc.
After several successful years of marketing the unique untwisted, constant chord series of Vortech International, Inc. (VII) extruded 6063-T6 aluminum rotor blades, it seems an ideal time to summarize our progress to date. With any new product, there are always going to be growing pains, but as I will point out, the successes of a number of projects are very encouraging. The extruded rotor blade system has many advantages: a surface free of imperfections such as rivets or seams, blade lengths easily tailored to the customer's individual requirements, availability in two airfoil selections (symmetrical NACA 0012 and asymmetrical 8H12) and a number of chord sizes ranging from 2 ¾ to 8, and a low cost yet dependable rotor blade. 6063-T6 aluminum was the material of choice for realizing the best compromise between strength, extrudability, and cost; the thin-skinned cross section of the blade precludes the use of higher strength aluminums, such as 6061-T6, while still keeping the cost within the budget of the average homebuilder. There is, however, no free lunch and the same general philosophy applies to the use of anything as important as a rotor blade. Care must be used when looking at the finish, blade balance and the strength of the root hub connection. The blades are supplied with a mill finish; it is recommended that the blade surface be initially worked with Scotchbrite, or equal, to remove any imperfections and then use standard aluminum polishing techniques to provide a long-lasting, weatherproof finish. Painting or anodizing is not advised. A full length 6061-T6 aluminum nose weight (for strengthing and balancing the system) is provided as part of the blade kit (along with plastic tip and root caps and grip plates). Balancing each blade both chordwise and spanwise is VERY important. Spanwise balance must be done for each blade set or inplane vibration will result, its severity depending on the rotor RPM and degree of imbalance. Chordwise imbalances on any rotor blade will result in higher collective and cyclic loads for helicopters and higher cyclic loads for gyros. It may also result in rotor blade flutter, this condition is particularly noticeable with helicopters at high speed. Gyros are not as susceptible because of their usually lower airspeeds, lower disk loading and fixed collective pitch resulting in high torsional blade stiffness. Blade attachment to the hub is another very important item. This is best accomplished by looking at what others have successfully done or contacting someone with experience in the design of rotor hubs. The VII blades have been successfully used in a number of flight projects that range from gyros to flying platforms. Ed Alderfer flies his Air Command gyro with a set of asymmetric airfoil 8 blades with great success. He has written an article, Evaluation Report: The New All-Aluminum Extruded Rotor (Rotorcraft, May 1997), that is recommended reading for those using the VII blade for gyros. 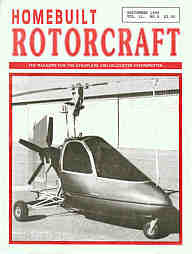 In Australia, Ric Hutchins of Ric's Rotors has made a very rugged and good flying rotor system with the 8 VII blade (Rotorcraft, October 1997). Ben Showers flies a symmetrical VII rotor blade on his Skytwister (Rotorcraft, October 1995) helicopter while the Eagle-Perch counter-rotating helicopters use the 4 3/4 chord asymmetric airfoil. The PAM Group also uses the counterrotating rotor system but with the large 8 chord symmetric airfoil. These blades turn at approximately 1250 RPM and provide a combined thrust of approximately 1000 pounds. The VII rotor blade system is accumulating a very positive record of testing and analysis. Through experimental testing the torsional twisting coefficients have been determined as well as the area moments of inertia which have been experimentally verified. These are important when determining the strength, bending moments, and dynamic characteristics of the blade. The PAM Group has also tensile-tested their rotor system (including an 8 symmetrical section of the VII blade) up to 35,000 pounds with no adverse effects to the blade section. In addition to these success stories, several fatigue analyses have been made that show, under normal conditions, a blade life in excess of a thousand hours depending on the particular application. Homebuilt Rotorcraft thanks Vortech International for their article, we have received many inquiries from interested individuals but wanting more information. The more information a company can get out on their products the better, we also understand that the more factual the information, the better, and to have names of those using your products is always a plus. Again, Thanks, this is what our readers want to read about.